This small pocket sized book is packed full of hints and tips. 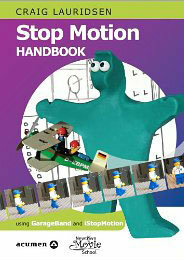 Spanning over 160 pages, the book produces a thorough step-by-step guide, taking the reader through all aspects of motion capture. There are nine different chapter headings covering scripts, setup, audio, props and the technique itself. The book is primarily a beginners guide, with an emphasis on using it within the classroom. It even includes twelve lesson plans for teachers to implement. Throughout, there's an evident attention to detail with the use of flow diagrams, annotated screen grabs and photos in order to help you digest the information given. The only down side is that all the examples given and software used is for Apple operating systems. There is no windows application used or alternatives given. Overall the structure of this book is easy to follow and jargon free, it doesn't patronise the reader and could be used for all ages not just in the classroom.